Three years ago I decided to go back to having a vinyl system and watched for a deal on a turntable. Found the Ariston that I have written about, bought a new Dynavector 10×5 and built, first a Hagerman Bugle, and then a Cornet 2 and happily collected albums. Then I stumbled across a well-used Clearaudio Aurum Beta S super cheap, concurrent with the arrival of the 47 Labs McBee cartridge for review, and discovered there was so much more to be heard. The Beta S trounced the Dynavector (right up until I snagged the cantilever; it now sits on the shelf atop this computer as a reminder to be more careful) but the McBee blew me away. I began to study the postings on the various audio boards to see if there was a clue to finding an affordable cartridge 70 Miles From Nowhere. My research found me waffling and wavering between having the Beta S re-tipped and buying a new Micro-Ace. A correspondence with a poster in the Asylum archives helped me settle on using the Beta S as a trade-in on the Micro-Ace just as I received word from Constantine that Musical Surroundings had a review sample of the new Nova Phenomena phono stage available for review. I asked for a Micro-Ace as well and Garth Leerer, El Presidente, agreed, stating that the two offered the very best combination of price/performance in their line. Getting to review great components is a treat, having the opportunity to audition one that I would have acquired ‘blind’ is a blessing. Oh Happy Day! If you read my review of the Aqvox 2CI, you will find how I became disenchanted with the Ariston and then acquired a KAB Technics SL-1210M5G turntable and arm. The Micro-Ace and the Nova Phenomena were as much responsible for that decision as the 2CI. Both phono stages were used to break in the Ace and both, in tandem with the Ace, showed me that I was missing so much in terms of soundstaging, treble purity and the mid-range magic that I had heard with the McBee. Due to editorial and manufacturers’ calendars, I have already written reviews of two components that arrived after the Musical Surroundings offerings: the above-mentioned Phono 2CI as well as the Accuphase E-450 integrated amplifier. All my impressions of the Phono 2CI, of course, and most of the Accuphase’ were done with the Ace. Oh, I mixed things up a bit with a Grado Green (a really terrible cartridge) and a borrowed Denon DL-103 (how do all those guys love this?). In the beginning, the Dynavector was rotating with but quickly gave way to the Ace. I mention this because each of these components, as well as two power amps I am currently reviewing, best revealed their individual characteristics with the Ace as source. Each component and cable change produced easily heard differences of nuance and shading. The Dynavector would have revealed as much but the Benz does so in a more refined manner. I recently hosted Al Steifel of Red Rock Audio and Impresario of the Rocky Mountain Audio Fest who visited to set-up a pair of his $39,750 dual mono-block Renaissance amplifiers for me to review. He had heard the $50,000 XLH REF-1812 speakers at CES and was so impressed (Al’s personal speakers are Audio Lab U-1’s), he felt he had to hear them with his amplifiers. I was waiting for a pair of Vampire 800C male RCA’s to switch phono leads from balanced to single-ended after the 2CI review, so we did all our listening that day with my Marantz 8001 SACD player. After I received and installed the new terminations on the Technics, I repeated some of the same selections on vinyl we listened to that day on CD. My impressions of the sound of these amplifiers was much the same, only better of course, because now the sound was analog! The bass had as much ‘slam’, the mids and treble were as crisp and clear and the dynamics equally forceful. But there was more. The vibrations of even electric bass strings could be clearly heard, just as on CD, but there was more depth and life to the image. Could you possibly ask more of a source component? The Micro-Ace does have a character of its own, of course. Even with step-up’s both active and passive, phono stages, pre-amplifers, amplifiers, speakers and cables between it and the listener, the Ace presents the music differently than any of the above-mentioned cartridges. Problem is, it’s so well balanced that it’s hard to pick out any part of the 8 octaves that it does better than any other! Let’s begin with the way it allows the annoying sss-ibilance on the Diana Krall Classsic recording of From Thisss Moment On to be heard but not exhibiting the phase shifting of the image one sometimes hears with sibilance. You know, one moment her voice is coming from the image center and, suddenly, thisss hisss comes from down over there. I’m fairly certain her voice coach noticed early on that she has that sibilant quality and decided to emphasize, rather than hide it. Another important attribute is the delicacy with which instruments like the Celeste are heard. I’ve about worn out my copy of RCA-LSC 2150, the well-known Prokofieff, Lt. Kije Suite. I can’t get enough of that Celeste. Ditto for the warm, plaintive tone of the Saxaphone. The Ace has a light touch when necessary, but also gets the bombast of the bass drums and Tympani pounding away behind massed strings and brass on the crescendos of the Kije theme. It carries the tune of each instrument while still presenting the whole. There’s none of that ‘music in a blender’ sound on loud passages heard from lesser equipment. And the Tuba never gets lost in the Double Bass section. Could there be two distinctly different ‘pop’ voices than Emmy Lou Harris and Mark Knopfler? One of the treats of All The Road Running is the contrast between his rich baritone and her sometimes ethereal, often edgy soprano, and the way the two voices merge and separate. His vocal richness never becomes syrupy and her country-plaintive treble seldom goes over the edge. There is such a narrow divide between correctly presenting treble texture and over-emphasizing it. “Detail”, getting all the notes without being harsh or shrill in the top octaves is, without a doubt, the most difficult task of music reproduction. A $550 cartridge in an $800 turntable/arm combination can’t be expected to be perfect here, but the Ace does quite well. With an effective mass of 8.8 grams and a dynamic compliance right in the middle range of 15, the Ace will have an ideal resonant frequency between 8 and 12 Hz with any tonearm weighing between 6 and 22 grams, which is just about all of them. My fellow fumble-fingered readers will be glad to know that the mounting holes are threaded! The short boron cantilever (less to snag!) makes sighting in on the stylus a little difficult but the cartridge body is nicely square and has a groove right down the front pointing to the stylus. 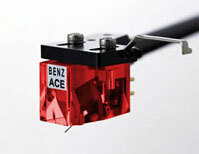 Before the Ace came along, boron cantilevers and Van Den Hul styli were not what you would expect at this price point. You’ll find in my upcoming review of the Nova Phenomena phono stage that it was sent to me set for 280 ohms resistance. The unusual flexibility of that unit allowed me to try lower and higher settings. I found that input loadings as low as 100 and as high as 660 ohms changed the sound somewhat but didn’t interfere with the basic character of the cartridge. It’s been awhile since I heard the 47 Labs McBee and even longer since I had the opportunity to hear a Koetsu or Lyra in top notch systems and then only in hotel and dealer showrooms. The Micro-Ace falls short of those. More money, a lot more money, buys absolutely effortless and beautiful highs, magical presence in the mid-range and bass and greater dynamic contrast. The Ace, however, has enough of those qualities to satisfy those of us for whom the $550 price is quite enough. There is tone, texture, dynamics and the conveyance of a believable soundstage sufficient to make listening to any type of music deeply satisfying.